In 1993 Greentrax Recordings released Sangsters debut album Begin, an album of traditional ballads blended with some contemporary songs. Later that year, Begin was chosen as a Cream of The Crop 1993 album by Scotland’s premier national newspaper The Scotsman. 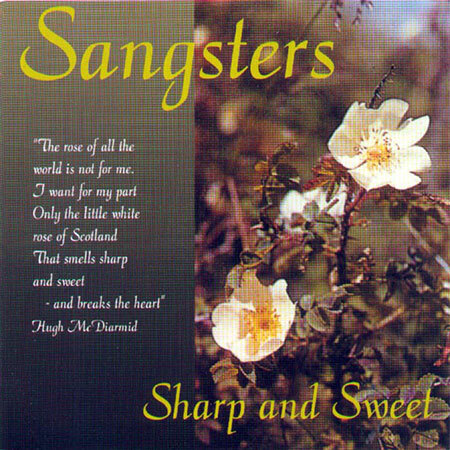 Since Begin, the line-up of Anne Combe (vocals), Fiona Forbes (vocals) and Scott Murray (guitar and vocals) has been augmented by the addition of John Blackwood (guitar and vocals), further enhancing the hallmark song element of Sangsters while further strengthening the instrumental aspect. The album is again a mixture of traditional and contemporary material, recorded and mixed by Ian McCalman. The individual members of Sangsters are all outstanding solo singers and Anne, Fiona and Scott are past winners of traditional singing competitions in Scotland. The title of the album comes from Hugh McDiarmid’s poem The Little White Rose (of Scotland). Wendy Weatherby (cello), Sandy Brechin (accordion), Jim Russell (whistle) and Davy Steele (bodhran) guest on the album.